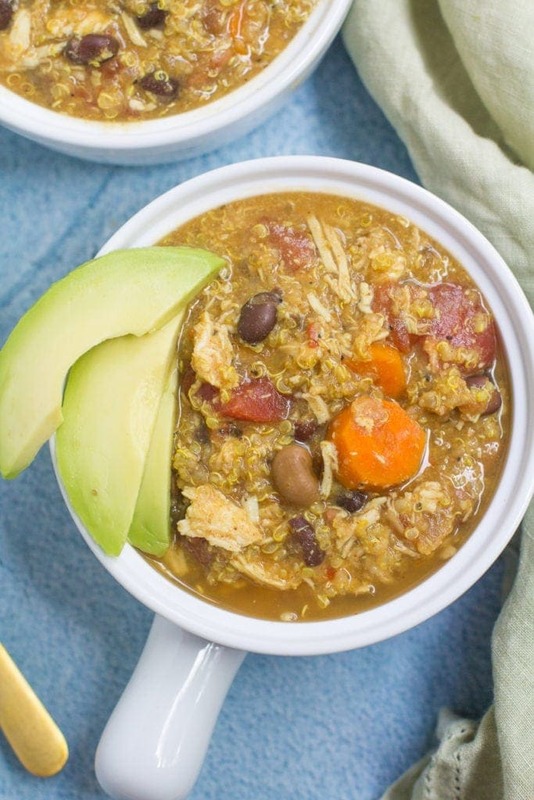 Crockpot Chicken Quinoa Taco Soup is a delicious gluten free fall dinner. 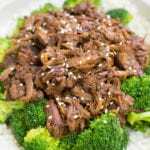 Made in the slow cooker & protein packed, it’s perfect for dinner or meal prepping. This post is written in partnership with Bob’s Red Mill. 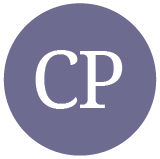 I’m so grateful that they generously donated to my charity efforts and feel lucky to work with amazing brands that stand for such important things! 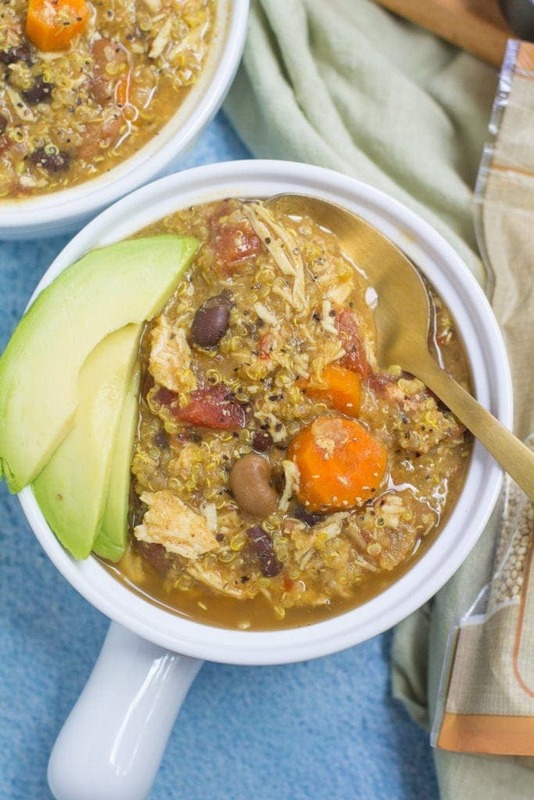 This Crockpot Chicken Quinoa Taco Soup is the ultimate fall dinner. 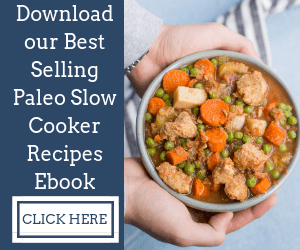 Here’s why: It’s made in the slow cooker (which is my favorite kitchen utensil), it’s warm and cozy, it tastes kinda like chili but feels way lighter when you eat it… and lastly it’s just super easy to make. 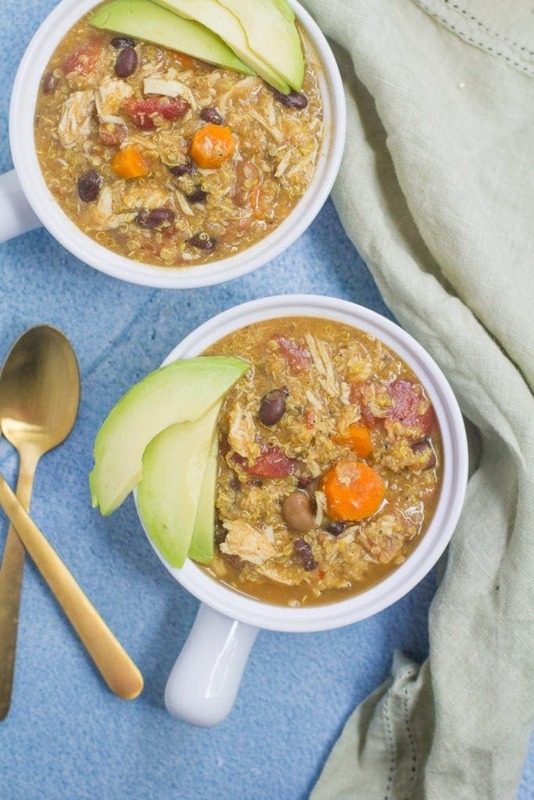 I love this Crockpot Chicken Quinoa Taco Soup because of it’s simplicity, but also because of it’s flavor. 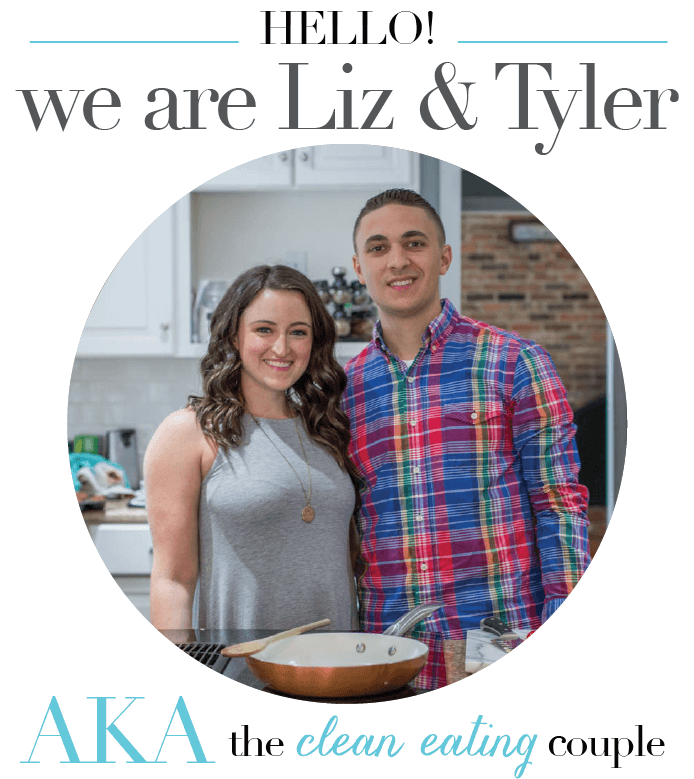 I had such a hard time naming the recipe, but as we were eating it we both agreed it is pretty much all the same things we would put in a taco or burrito bowl.. just in the form of soup! 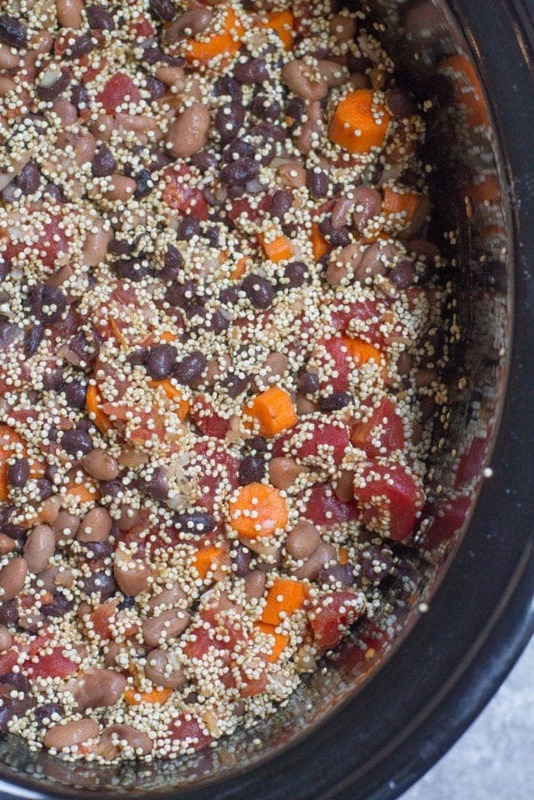 It has all my favorite veggies, protein from the beans and chicken, and whole grains from the quinoa! I used Bob’s Red Mill Quinoa in this delicious soup to make it much heartier, and for all the nutritional benefits that quinoa has! 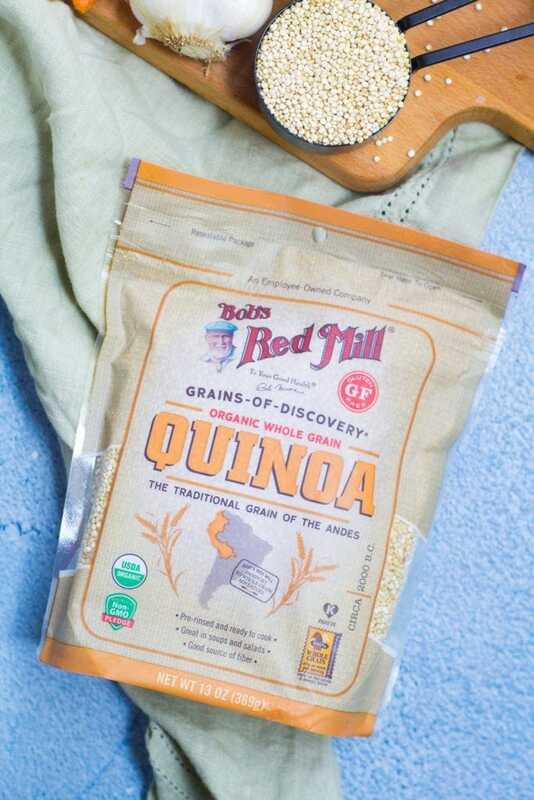 You may not know this, but 1/4 cup quinoa has 6g of protein, plus it’s packed with fiber and iron! We use quinoa as a side, on top of salads and in soups all the time. I always opt to get Bob’s Red Mill for my grains and seeds when I can because of the quality, and the price. This quinoa is organic, non-gmo, certified gluten free, and just tastes yummy! Some quinoa can taste a little funky when you cook it – but this one always comes out fluffy and delicious! 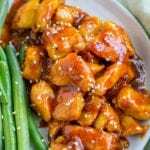 In order to make this meal, you simply layer your chicken on the bottom of the crockpot, add all your ingredients on top, stir, and add your broth. 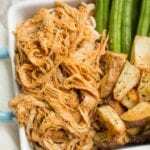 After cooking for 6 hours on low in the crockpot – you can shred your chicken and add it back to the crockpot. You can shred it right in the crockpot, or remove the whole chicken breasts (carefully – they will be very tender!) and shred them in a separate bowl to avoid scratching your crockpot. You can also put them in your kitchen aid mixer and ‘beat’ them on the lowest setting with the paddle attachment. The chicken will fall apart in seconds! 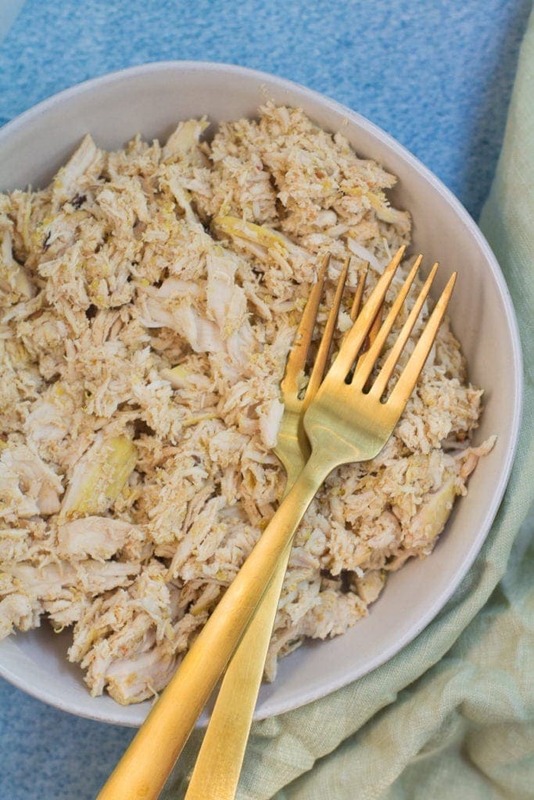 Once your chicken is shredded, you add it back into your slow cooker, stir to combine, and get ready to dig in! 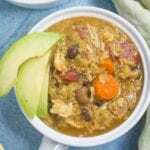 I like to serve my soup with sliced avocado, but you could also add cheese on top or even crushed tortilla chips! The crunch would be delicious. 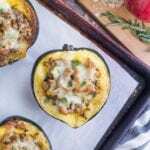 Regardless of how you serve the soup, it is s0 tasty and perfect for feeding a crowd or meal prepping! We are going to be enjoying this all fall/winter long and will definitely be bringing it to one of our football Sunday parties! 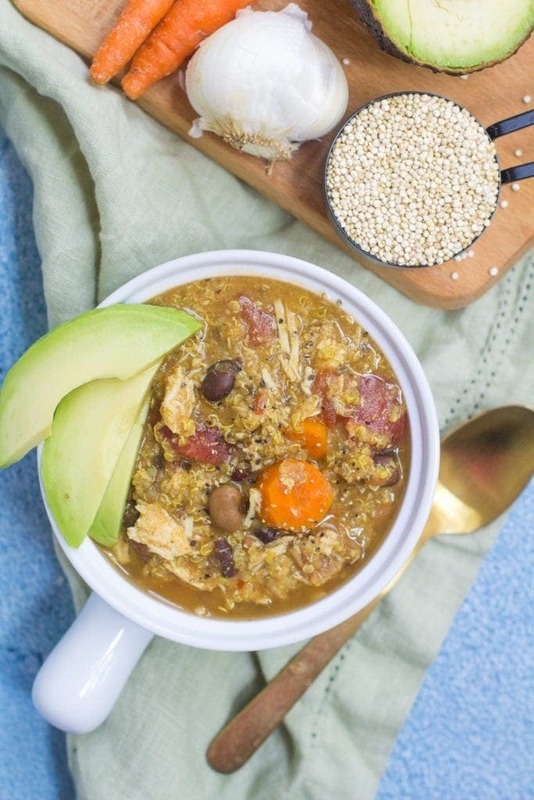 Crockpot Chicken Quinoa Taco Soup is a delicious gluten free fall dinner. 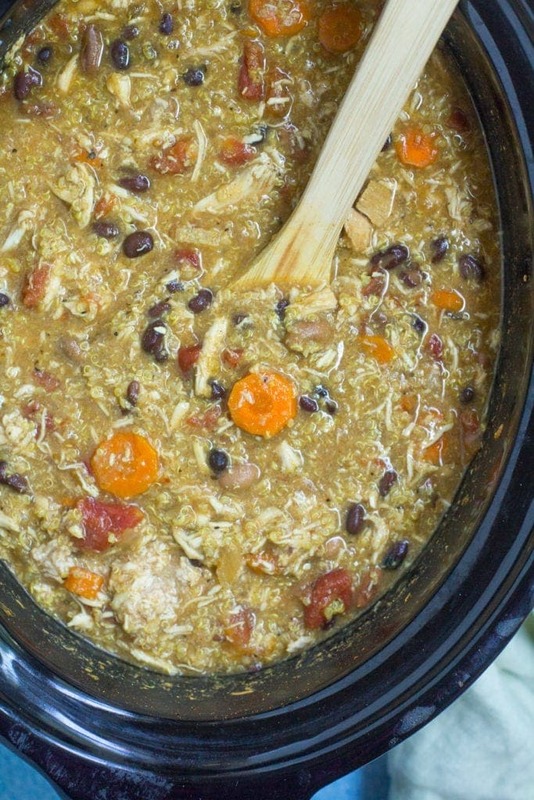 Made in the slow cooker & protein packed, it's perfect for dinner or meal prepping. Cover chicken with chopped veggies, diced tomatoes, beans, quinoa and spices. After 6 hours, shred chicken breasts. 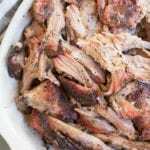 You can shred them right in the crockpot with two forks or remove from the pan and pull apart on a cutting board. The chicken will be tender enough that it falls apart. 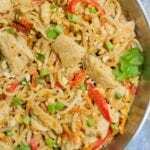 Stir the chicken in with the other ingredients. 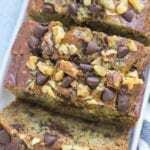 Click here to get the nutrition facts for this recipe.